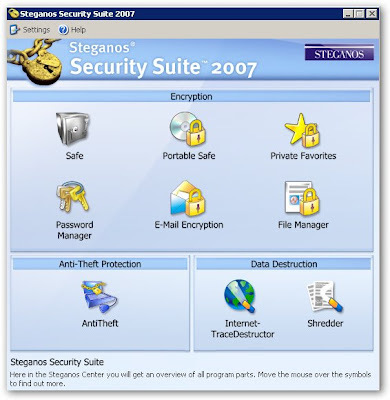 Steganos Security Suite 2007 is a software that combines the powerful techniques of cryptography and steganography in order to reach a maximum of security. The program uses 256-bit AES encryption. The complete set of security tools includes file encryption and hiding, e-mail encryption, password manager and generator. The included Steganos Safe allows you to automatically protect a complete drive. Additional features include file shredder, internet trace removal,anti-theft protection and more. Step 1 : go to Steganos website fill in your valid email address,they will sending the product key to your email account. Step 2 : Go to tocows.com download Steganos Security Suite 2007. Step 3 : Enter the product key after installation. PS: Supposed need go to Steganos homepage to download this software but there are no respond,then suggested go to tocows.com.